TBILISI IVANE JAVAKHISHVILI STATE UNIVERSITY MEDICAL-DIAGNOSTIC CENTER (GENERAL DIRECTOR - ACAD. Prof./Dr. NINO BERIDZE MD ) REPRESENTS A JOINT CLINICAL BASE OF ORGANISATION GESTOSIS-SOCIETY FOR THE STUDY OF PATHOPHYSIOLOGY OF PREGNANCY, INTERCONTINENTAL ACADEMY OF MEDICAL-SOCIAL SCIENCES (IAMSS). Dr. Prof Zurab Rainauli MD.PhD. 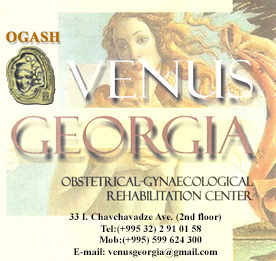 CATHEDRAL BOARDS AND DEPARTMENTS OF THE OB/GYN, OGASH IAMSS, NATIONAL CENTER FOR THE STUDY OF PATHOPHYSIOLOGY OF PREGNANCY AND FETUS ATTACHES PARTICULAR IMPORTANCE TO THE APPLICATION OF MODERN DIAGNOSTIC AND THERAPEUTIC TECHNOLOGIES IN THE PATHOGENESIS OF GESTOSIS AND MISCARRIAGES. BASED ON THE ESSENTIAL PROPERTIES OF HORMONAL CHANGES, AUTOIMMUNE PROCESSES, CHRONIC VIRAL AND MICROBIAL INFECTIONS, AS WELL AS MEDICAL-GENETIC FACTORS THE ORGMETHOD CABINET HAS DEVELOPED A DIAGNOSTIC AND THERAPEUTIC-OBSTETRIC SYSTEM OF PREPARATION FOR PREGNANCY AND STEP-WISE SUPERVISION OF THE CONDITION OF FETUS AND MOTHER DURING PREGNANCY, BASED ON THE STANDARDS OF MODERN INTERNATIONAL REPRODUCTIVE AND FETO-MATERNAL MEDICINE. USING NEW TECHNOLOGIES DIAGNOSTICS AND TREATMENT OF FETUS AS PATIENT IS CONDUCTED (BY COMBINING NON-MEDICATED AND APPARATUS METHODS). SIDE BY SIDE WITH VARIOUS FORMS OF HORMONAL AND ANTIPHLOGISTIC MEDICAL PREPARATIONS A DIFFERENTIATED THERAPY IS APPLIED WITH BACTERIOPHAGE IMMUNOGLOBULIN, APOPTOSIS AND INTERFERON INDUCTORS. OF SPECIAL IMPORTANCE IS THE USAGE OF MODERN EFFERENT THERAPEUTIC METHODS, SUCH AS EXTRA CORPORAL OPERATIONAL HEMOCORRECTION – PLASMAFEREZ AND HEMOPHOTOMODIFICATION WITH INFRARED LASER AND RADIATION OF BLOOD WITH HELIUM-NEON LASER. THE EFFERENT METHODS ARE SUCCESSFULLY USED DURING GESTOSIS, AUTOIMMUNE DISTURBANCES AND CHRONIC IVC SYNDROME, FOR THE PROPHYLAXIS AND TREATMENT OF HEMORRHAGE AND HEMORRHAGIC SHOCK AND FOR THE PROPHYLAXIS AND TREATMENT OF VARIOUS KINDS OF LABOR ACTIVITY ANOMALIES. CHILD-BEARING AND ALL KINDS OF OBSTETRICAL OPERATIONS ARE CONDUCTED WITH THE EFFECT OF MAXIMUM ANESTHESIA THROUGH THE APPLICATION OF MODERN ANESTHETIC TECHNOLOGIES. The Interventional Radiology Service is established by Ultrasound Education and Research Centre “GEOJEFF”at Tbilisi State Medical University Central Clinic. Director of Interventional Radiology Service is Professor Malkhaz Mizandari. This Service performs Ultrasound Guided Diagnostic and Imaging Guided (Ultrasound and Combined Ultrasound-X-Ray Guidance) Low-Invasive Treatment Procedures. The Treatment Procedures are performed under real-time Ultrasound or Combined Ultrasound-X-Ray control. Ultrasound Guidance – aspiration, rinsing, sclerotherapy procedures using percutaneal approach - abdominal organs (liver, pancreas, kidney, adrenal, retroperitoneal masses), breast, thyroid, soft tissues, subcutaneal neural plexus (for anesthesia); rectal and vaginal approach is used for organs of small pelvis (ovary, tube, ectopic pregnancy, prostate, Douglas pouch). Since 2006 “GEOJEFF” Centre and Interventional Radiology Service of TSMU Central Clinic Interventional Radiology Service collaborates with Organization Gestosis Affiliated and Sponsored Hospitals (OGASH). The Ultrasound Education and Research Centre “GEOJEFF” – the Affiliated Centre of Jefferson Ultrasound Research and Education Institute (JUREI) of Thomas Jefferson University (Philadelphia, PA, USA) is established in 1998. From the very beginning “GEOJEFF” Centre operates in strong collaboration with Tbilisi State Medical University (TSMU). Since 2006 “GEOJEFF” Centre collaborates with Organization Gestosis Affiliated and Sponsored Hospitals (OGASH). “GEOJEFF” Centre operates the post-graduate training in Diagnostic and Interventional Ultrasound for Medical Doctors. The training starts with basic 12 week postgraduate Certificate Program in Diagnostic Ultrasound entitled “General Course in Diagnostic Ultrasound”, which might be followed (if required) by fellowship to get deeper knowledge and practical skills in definite spheres of Diagnostic and Interventional Ultrasound. During the whole training period the program participants are allowed to use the comprehensive educational material of “GEOJEFF” Centre; from the very beginning of the program they attend and, after the basic training course completion, perform clinical examinations and participate in ultrasound guided interventions. “GEOJEFF” Centre is provided with modern diagnostic and education equipment, comprehensive education material and operates in Georgian, Russian and English. “GEOJEFF” Centre is located at TSMU Central Clinic. Objectives for the program – sufficient theoretic knowledge and technical skills of program students. Test control of the 12 week basic certificate program – pre and post test examinations are provided by Jefferson University. If successfully passed the post-test (70% and more correct answers) the program graduate is awarded The Certificate of Commendation issued by JUREI and “GEOJEFF” Centre. If the graduate fails passing post test, he (she) gets the Certificate of Attendance issued by “GEOJEFF” Centre. After the completion of the whole program the participant is awarded the “GEOJEFF” Centre certificate representing the practical skills of participant. IN 2005 - prof. Avtandil Chkheidze - OGASH Chairman & President established OGASH Library Centre and IAMSS Web library , a centre of wisdom and information for those who need scientific support and encouragement. By the desired location of this unique library in Georgia, especially the medical profession of this country is privileged for its easy access. We dearly hope that library is a living part of medical practice and research in Georgia, its knowledge and presented results may add such to the health and well-being of the Georgian population. The basic knowledge about EPH – Gestosis (wrongly called “pre-eclampsia”) is incorporated in the OGASH Library, part of the National Medical Library of Georgia in Tbilisi, Georgia. It will be the starting point for further research in the fields of EPH – Gestosis, the most frequent and most deadly complication of a normal pregnancy. It is killer #1, with the baby 100 times more in danger than the mother is is. Its importance is presented by the fact that up to 60 % of all perinatal fetal deaths are in one way or other connected with EPH – Gestosis. Also with the fact that 98% of all perinatal death occurs in developing countries (WHO) More than half of them could be prevented by applying the knowledge about EPH – Gestosis. IN 2004 BY THE INSTRUCTIONS O.G. SECRETARIATS GENERAL ESTABLISHED A SPECIAL OUTPATIENT DEPARTMENT POST PARTUM EXAMINATIONS OF GESTOSIS PATIENTS. Immunoferment F-E3, DHEA-S, 17-OH-PROG, CA-125, CEA, CA-15-3, TORCH-STD-s, complex investigation of the activity of autoimmune processes: APS, ACA, A-ß-CG-Ab, A-a-FP-Ab, A-Insul-Ab, A-Prol-Ab, A-TRO-Ab, h-TG, A-hTG-Ab, AOA, ASA, ANA, ds-DNA, Neopterin index, CRP index, Free Testosteron. Radioimmune, immune-fluorescence (Time-Resolved) Prl. LH,FSH, Test, Estrad, Prog. T4, FT4, T3, FT3, TSH, TSH-ultra, Cort, AFP, ß-CG, h-TG, A-hTG, F-hCG, GH, Neonatal-TSH, “Reglan- test”,"Apoptosis Index" - CD95+ . Phase contrast microscopy (oncological and microbiological diagnostics). Colpocervical Material by methodology of. Prof. G. Miniello. Reproductive telemedicine. Complex Telediagnostics Colpocervical and endometrial materials. Broadened bacteriological investigation of biological tissue and inoculant, with the assessment of sensitivity of preparations (including phages) to pathological agents (antiviral, antibacterial and antimycosis preparations). Biochemical tests (broadened coagulometry, hemostaziogram) aPTT, ATR, AT-III, Lupus Index, Factor V, Protein C, FM-test, Fis-test. Urinalysis: 17-KS, 17-OKS, assessment of glucose in blood. DR (Loci). Index hystocompatibility (HLA) between couples. Detection antierytrocyte (complete and incomplete) and antileucocyte (anti-HLA) antibodies. Immunogram-index immunoregulatority Th/Ts, Immunoglobulin levels: Ig G, Ig A, Ig M.
Methods of examination for immunoincompatibility married couples. Out & during pregnancy. Typification by immunochemical method of specifically marked antibodies with the assessment of antigen HLA-DR II (“de-Luca’s test”), HLA-B27, HLA-G.